Create the event of your life with a destination wedding on one of the charming islands in the Caribbean Sea. With the prompt help of our devoted Omaha travel agents at Enchanted Honeymoons, you can leave the work of planning and organizing your destination wedding to us. We’ll work diligently alongside you to make sure your trip, ceremony, and celebration truly embody your divine vision. With connections to the best resorts in the Caribbean, your ideal stay can be booked with ease, including the travel itinerary. With a wide variety of wedding venues, services, and amenities available, we will customize the experience to your personal wishes for your big day. Let nothing stand in the way of you and your extraordinary destination wedding—the beautiful isles of the Caribbean await your arrival. A relaxing stay at an all-inclusive resort is a popular choice for couples who are looking to hold their special event in the Caribbean. Choose from extensive package options that include everything from food and drinks to excursions at sea. Both you and your guests can enjoy a sensational escape to paradise without a worry in the world. Say “I do” on the shimmering shoreline with the sound of gentle ocean breezes and slow-rolling waves. With radiant beach scenery and unique beauty on every island, you and your guests can truly take in each harmonious moment. Whether you choose to hold your ceremony along Barbados’ striking Pebble Beach or Jamaica’s famous Seven Mile Beach, your wedding by the sea will be a magical memory for all. Get away with your loved one to a resort that is peacefully secluded from the rest of the island. There are many adult-only resorts in the Caribbean that offer private, tranquil beaches and stunning suites made just for the company of two. Stay at the Sandals Grande Antigua Resort & Spa for an intimate setting, or try the IBEROSTAR’s Grand Hotel Bávaro in Punta Cana for fine dining and live performances, as well as luxurious accommodations. There’s something for everyone on your guest list at a number of the family-friendly resorts in the Caribbean. Book your stay at the Majestic Elegance in Punta Cana, with accommodations that allow all ages to find their piece of paradise. With enough guests, you can hold your ceremony on Bávaro Beach for no cost! Let the allure of the Caribbean inspire astonishing adventures throughout your memorable trip as you explore some of the islands’ most unique attractions. A few of the Caribbean islands are home to the area’s oldest caves. Venture out to see cave paintings in the Guadirikiri Caves of Aruba or the crystal formations in the Camuy Caves of Puerto Rico for a miraculous sight. Many beaches in the Caribbean are world-renowned for their striking, sun-soaked shores, making your options nearly endless. Roll out your towel next to the bright turquoise waters and mountain backdrop of Flamenco Beach in Puerto Rico, or relax under the palms of a coconut tree on Seven Mile Beach in the Cayman Islands. Marvel at vivid coral reefs that lie just beyond the islands’ powdery sands. 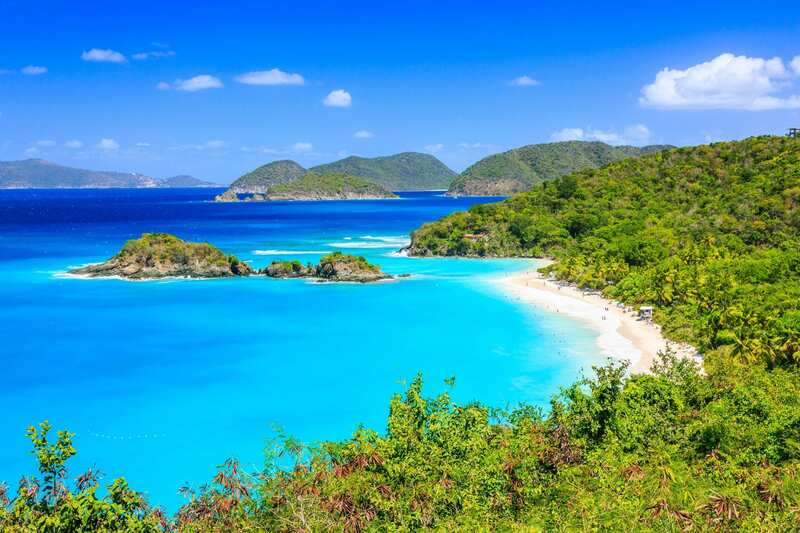 Snorkel the underwater trails of Trunk Bay in the U.S. Virgin Islands, or chase schools of peppy fish along the astounding Library Reef of Turks and Caicos. Spend the day with some unusual company in the form of tropical fish and other colorful sea critters. Feed friendly fish right out of the palm of your hand at Coki Beach in St. Thomas, or pet the stingrays of Gibbs Cay in Turks and Caicos for an underwater adventure of a lifetime. Our wide selection of wedding package options include 12 locations in the Caribbean. Whether you have visions of yourself lounging in the sun in exotic Aruba, or chasing underwater adventures in the cays of St. Lucia, your destination wedding in the Caribbean with be nothing short of a fairy tale. Call to learn more about destination wedding packages in the Caribbean! Are you ready to begin planning your picture-perfect wedding in a Caribbean paradise? Call us at 402-281-3022 to speak with an Enchanted Honeymoons Omaha travel agent to learn about all of your options!